Turboexpanders are used in a number of applications, including floating LNG (liquefied natural gas), LPG (liquefied petroleum gas) / NGL (natural gas liquids), dew point control, and ethylene plants. Used as a highly efficient system that takes advantage of high pressure, high-temperature flows, the turboexpander both produces cryogenic temperatures and simultaneously converts thermal energy into shaft power. 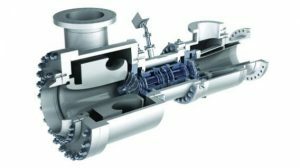 Essentially, a turboexpander is comprised of a radial inflow expansion turbine and a centrifugal compressor combined as a single unit on a rigid shaft. The process fluid from a plant stream will run through the expansion turbine to both provide low-temperature refrigeration and convert thermal energy to mechanical power as a byproduct. First, the gas will radially enter the variable inlet nozzles (or guide vanes) of the turbine, which will allow for a localized increase in fluid velocity prior to entering the turbine wheel. The turbine wheel will accept this high-temperature, high-pressure, accelerated gas and convert it into mechanical energy via shaft rotation. The primary product of a turboexpander manifests at the outflow of this turbine. After the process gas passes through the turbine wheel, this gas has expanded so dramatically that it produces cryogenic temperatures colder than any other equipment in the plant. The useful mechanical energy converted from this system is generally used to drive a centrifugal compressor positioned on the opposite end of the shaft. 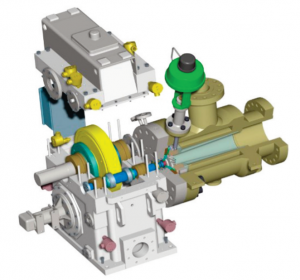 In the case of this expander-compressor setup, the mentioned turboexpander technology avoids the excessive use of fuel consumption seen in other systems, and significantly decreases the CO2 footprint of the overall design. As well, there are various examples of turboexpanders that use an expander-generator setup, which converts the mechanical energy from the turbine into direct electrical power. Turboexpanders have come a long way in the last 40 years. With the advent of magnetic bearings and more advanced sealing systems, turboexpanders have been able to handle shaft speeds in large and small machines of up to 10,000 rpm and 120,000 rpm, respectively. Moreover, innovations in specific CFD modules for turbomachinery have allowed turboexpander systems to achieve efficiencies upwards of 90%. All the liquefaction applications mentioned above use this technology due to the optimal efficiencies it can produce. An accepted condensation method for gases in the past was a technique called Joule-Thomson cooling. The Joule-Thomson effect describes the phenomenon that a temperature change can occur in a gas due to a sudden pressure change over a valve. Although extremely important in the advancement of refrigeration systems, Joule-Thomson cooling exclusively required much higher pressure in order to remove the same amount of energy because no external work is done. The introduction of mechanical load devices allowed the process gas to distribute its energy more rapidly, in turn allowing more optimal refrigeration conditions.